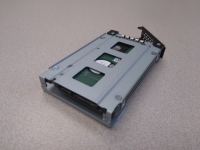 In order to use the MB991U3-1SB you just need to have your own 2.5" drive to install in the drive tray, and then simply pop the tray back in to the enclosure. 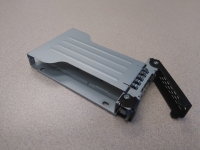 The first image in this section shows an empty drive tray, which should accept 2.5" drives of any standard height. 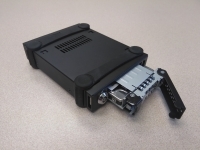 There is plenty of room to slide a drive in and bolt it down with the four included screws. 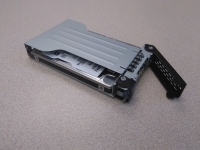 Here we see a 500GB Western Digital 2.5" hard drive has been installed in the tray. The process took just a few seconds, and there is definitely room for drives of all heights. Once it is bolted to the tray, just slide it back in to the MB991U3-1SB and latch it in place. Locking the enclosure is optional, it will function just fine if left unlocked. 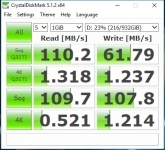 The final image in this section shows a screenshot from CrystalDiskMark which confirms that USB 3.0 type speeds are possible. Anything over 30-something MB/s would tell me we have something better than USB 2.0, but speeds over 100MB/s are definitely to be expected for a USB 3.0 device. In use, there is nothing to complain about with this enclosure. It allows for fast data transfers, doesn't add any noise to the system, and the LED that indicates power and drive activity is very subtle, so it will not distract or annoy you.